The silent Stone Forest of Yunnan, with its rocks jutting out of the ground like petrified trees, is an ancient wonder unmatched throughout the world. Its history stretches back over 230 million years, when it was once a vast uninhabited ocean. As the water drained away, giant rocks appeared in its wake and slowly eroded over time, forming the alien shapes that we see today. There’s an old local saying in Yunnan that goes “if you have visited Kunming without visiting the Stone Forest, you have wasted your time” and, blunt though it may be, it speaks to how important this site is to the people of the province. Everyone sees something different in this stony wonderland. You may find these fanciful rocks look like animals, plants, people, or even deities! Or they may just look like rocks. The Stone Forest, or Shilin (石林) in Chinese, is about 90 kilometres (56 mi) away from the provincial capital of Kunming. The site is divided into seven areas known as the Greater and Lesser Stone Forests, the Naigu Stone Forest, Zhiyun Cave, Lake Chang, Lake Yue, Dadie Waterfall, and Qifeng Cave. Each of these scenic areas has its own peculiar charm. As soon as you enter the Stone Forest, you’ll be met with a plethora of rocks looming over a crystal clear lake. Just beyond the lake, you’ll find the Lion Pool, where a huge boulder resembling a squatting lion stands guard. This is the entrance to the Greater and Lesser Stone Forests, which are full of fantastically shaped rocks that are sure to spark your imagination. From the ethereal sounding “Lotus Peak” and “Pinnacles Propping up the Sky” to the rather more amusing “Stone Singing Praises of Plums” and “Rhinoceros Admiring the Moon”, we’re sure you’ll delight in learning the names of these many formations and perhaps inventing a few names of your own! In Zhiyun Cave, you’ll find a spectacular and rather spooky subterranean version of the stone forests outside. This miniature, underground forest is illuminated by coloured lights, giving it an otherworldly appearance, and it is said that no matter which rock you knock on, each one has a different voice. Like Zhiyun Cave, Lake Chang boasts a small rocky forest of its own. In this 3-kilometre-long (2 mi) lake there are numerous underwater stalagmites that give the pool the appearance of an aquatic labyrinth. The lake is so massive that there’s even an island at its centre! Not far from all these karst delights, you’ll find the Qifeng or “Strange Wind” Cave. From August to November every year, gales lasting two to three minutes in length burst out of the cave at 30 minute intervals. No one knows the precise nature of this natural phenomenon, but witnessing this “strange wind” first-hand is both a shocking and delightful experience. If you take a walk through these extraordinary labyrinths, you may even come upon the protected zone, where you’ll find ancient frescos painted on the stone walls. These “cave paintings”, so to speak, date all the way back to the Neolithic Period and were made using a mixture of animal blood and minerals. They are one of the few remaining links to our evolutionary ancestors and the sight of them, in their humble glory, is truly breath-taking. Alongside the many fossils and paintings that are part of this protected zone, it’s hard not to feel as though you have returned to your primal beginnings. That is, until you return to your tour bus and wonder how our ancient ancestors ever got by without air-conditioning! Perhaps the most famous karst formation in the Stone Forest is that of the mythical Ashima. According to legend, Ashima was a kind, intelligent, hard-working and beautiful girl from the Sani branch of the Yi ethnic minority. In some variations of the story, she falls in love with an orphaned shepherd named Ahei, whilst in other variations Ahei is her loving brother. Ashima’s happy life takes a turn for the worse when she catches the eye of Azhi, the son of a wealthy landowner. When she refuses his offer of marriage, Azhi arranges to have her kidnapped and brought to his fortress. On discovering his beloved is missing, Ahei rushes to confront Azhi and engages him in a riddle-singing contest. After three solid days of singing, Ahei won the contest and rescued Ashima. Tragically, as they are rode away from the fortress, the nefarious Azhi opened the floodgates and diverted the river into the valley. Ahei survived, but Ashima tragically drowned. When the immortals heard Ahei’s anguished cries, in an effort to comfort him they transformed Ashima’s body into stone. She now stands in the Stone Forest as a symbol of hope and freedom to choose who you wish to marry. Every year, on June 24th according to the Chinese lunar calendar, members of the Sani branch gather at the stone statue of Ashima and celebrate the Torch Festival. They take part in traditional performances, such as wrestling, bull fighting, pole-climbing, dragon-dancing, lion-dancing and the A-xi Moon Dance, and pay homage to their heroine. The story of Ashima was first transcribed in the 1940s and performed in Kunming. Nowadays, it is considered one of the top Chinese dance dramas and has been translated into eight different languages, enjoying performances across the globe. 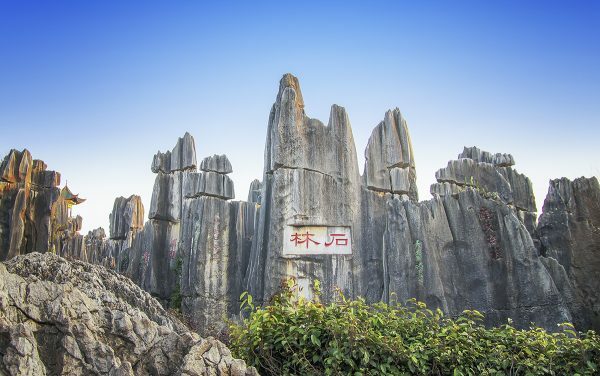 The Stone Forest can be easily reached from Kunming via the numerous tour buses that shuttle between the city and the scenic area, which take approximately 3 hours. There are a handful of hostels and hotels near the Stone Forest and, if you’re feeling particularly adventurous, you can even rough it in one of the designated camp sites within the scenic area. Although there are not many restaurants in the area and many of the dishes there are quite simple, we feel this only adds to the rustic charm of the site. Just don’t get too used to living like a caveman, or you might become one!